Joseph’s 11 brothers do not appreciate the coat of many colors and that means trouble for Joseph. From left: Pat Scully, Greg Foster, Billy Rankis, Spencer Sewall, Andy Barber, Sharon Henderson, Joshua Beach and Chase Tomberlin. 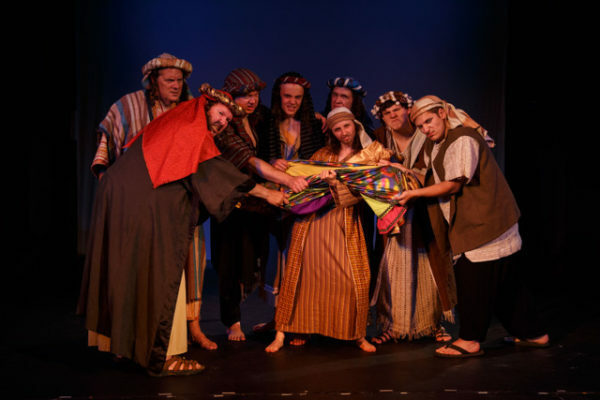 BATH — “Joseph and the Amazing Technicolor Dreamcoat” will kick off the 2018-19 performance season at 7:30 p.m. Sept. 7-8 and 14-15, and 2 p.m. Sept. 9 and 16, at the Chocolate Church Arts Center, 804 Washington St. This musical written by Andrew Lloyd Webber with lyrics by Tim Rice is a reimagining of the Biblical story of Joseph, his father Jacob, 11 brothers and the coat of many colors. Told entirely through song with the help of a main character narrator portrayed by Hope Horton of Brunswick, the musical follows the adventures of preferred son Joseph portrayed by Max Middleton of Bath. After being sold into slavery by his brothers, Joseph ingratiates himself with Egyptian noble Potiphar portrayed by Andy Sarapas of Brunswick, but ends up in jail after refusing the amorous advances of Potiphar’s wife portrayed by Shirley Bernier of Lisbon Falls. While imprisoned, Joseph discovers his ability to interpret dreams, and he soon finds himself in front of the mighty but troubled, Elvis-inspired, Pharaoh portrayed by Theodore Merrill of Richmond. Joseph’s solution to Egypt’s famine elevates him to Pharaoh’s right-hand man and reunites him with his family. The Chocolate Church production of Joseph & The Amazing Technicolor Dreamcoat celebrates 50 years since the show was first performed in London. The vivid costumes can be considered as a supporting character in the storytelling. Director Thom Watson called Marie Waltrip, who was the seamstress in the last production twelve years ago at the Chocolate Church. Even though Marie moved from Maine to Lexington Park, Maryland, she did not hesitate to offer to pack up her fabric and borrow costumes from Three Notch Theater and New Town Players and head north to costume this show. Tickets are $12 advance and $15 at the door. For 41 years, The Chocolate Church Arts Center has presented the best in community theatre and music. Tickets are available at the box office 442-8455 or for purchase online www.chocolatechurcharts.org.